Someone recently asked me which of my paintings took me the longest…good question! I immediately thought, well the largest ones of course, they involve so many layers upon layers of details and careful study and planning, sometimes taking me weeks to complete. But then I thought, wait a minute, I have some that I became completely stuck on, in that I mean not sure what to do next, or maybe “what’s wrong with this picture?” I know there’s something just not quite right but I can’t for the life of me figure out what it is! So I stare at it or stew over it for days, until I have to just put it away and not look at it anymore. It can drive me crazy, but then sometime later, (like maybe a year or more even!) I’ll pull it out and with fresh eyes be able to see what’s missing or wrong and Ta Da, it’s finished! Yep, those ones take a really long time. Then I thought, no wait a minute…, there are some subjects that I soooo want to paint, particularly difficult ones with much more detail or complicated structure than I can even figure out. I know I’ll get to them eventually, but as much as I want to try to do it even scared, I know I would be in way over my head, or “boxing above my weight”…as I’ve been told I tend to do sometimes. So I put them off for someday, maybe when my skill levels are stronger and I’m less terrified of that flower! So yeah, those take the longest, the ones I haven’t done yet but have been meaning to do for years. So don’t give up friends! Sometimes it’s more about the practice and process in the journey, we’ll get there, or at least have fun trying and hopefully learn from the struggles along the way! I always try to keep a sketchbook / artist’s journal…, or several actually, that’s probably why I rarely finish any one. I have one in my car, one in my travel backpack, a little one in my handbag, several randomly stuffed in drawers around my house or studio. 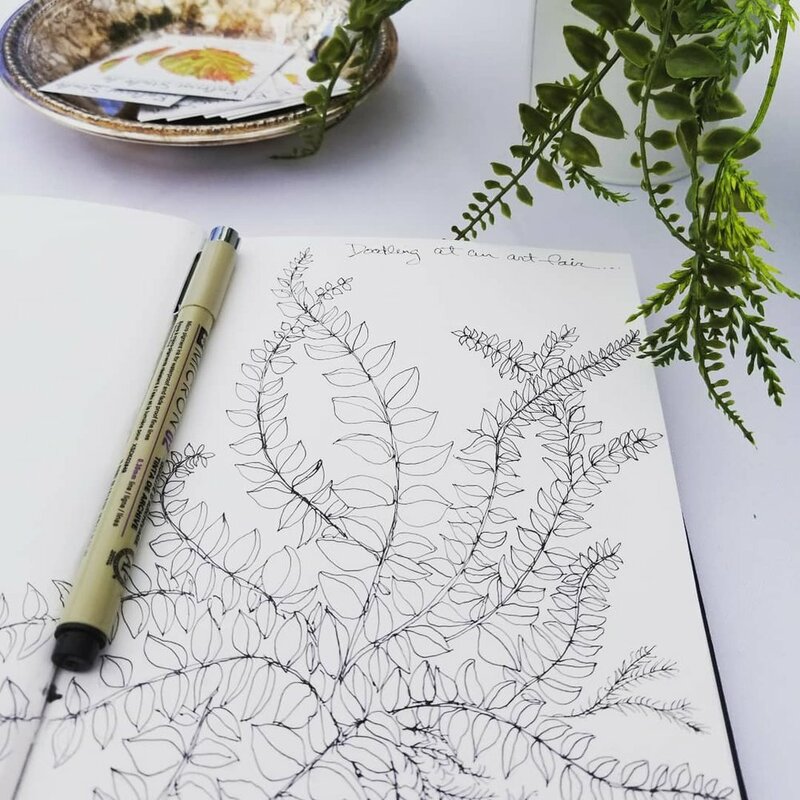 I often try to join daily journaling groups, and things like “Inktober” challenges, with accountability and prompts from other journalists to keep me drawing, even if I rarely keep up, it’s still fun to see what other people are up to. Other important things often get in the way of my daily doodles, but it’s always good to be ready just in case I see something that inspires me while going about my day. Drawing it out sometimes helps me to remember something that struck me at the time. My pages often go unfinished, or never grow into the vision I had of whatever inspired me in the first place,…but sometimes they do! Some people I know have such gorgeous journal entries they’re worthy of framing themselves, or publishing into a real book maybe! Not mine, I sometimes think some of mine might need to be ripped out and thrown away even, but I guess it’s part of the journey, and it’s still a good practice to keep, even if only occasionally. 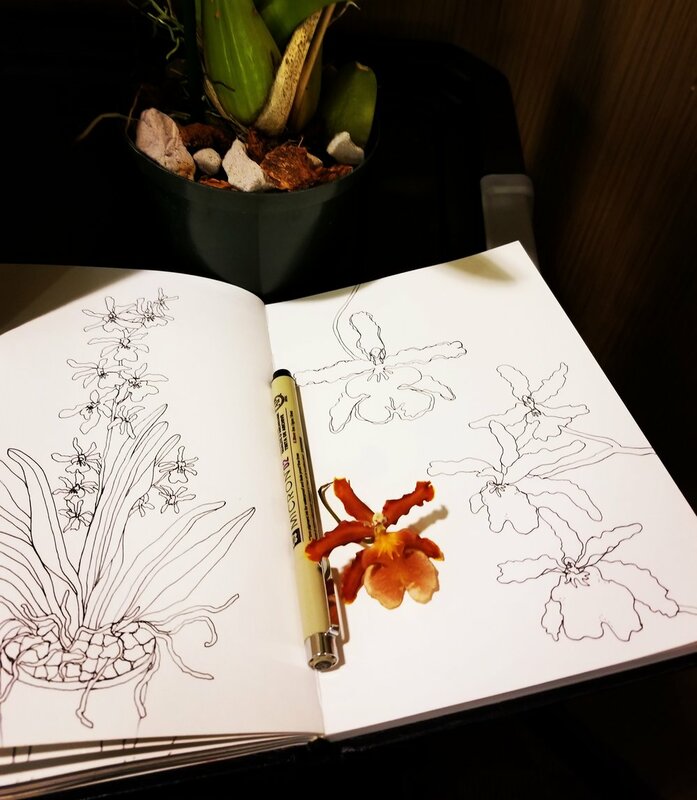 So here are a couple of entries from one of my journals, I hope you get yourself a book of paper and do some doodling yourself, even if they never develop into anything more than a little doodle, the creative process is a wonderful thing, and often very therapeutic! I have always loved going to markets, farmer's markets, flea markets, antique markets, European markets, you name it, I'm there. 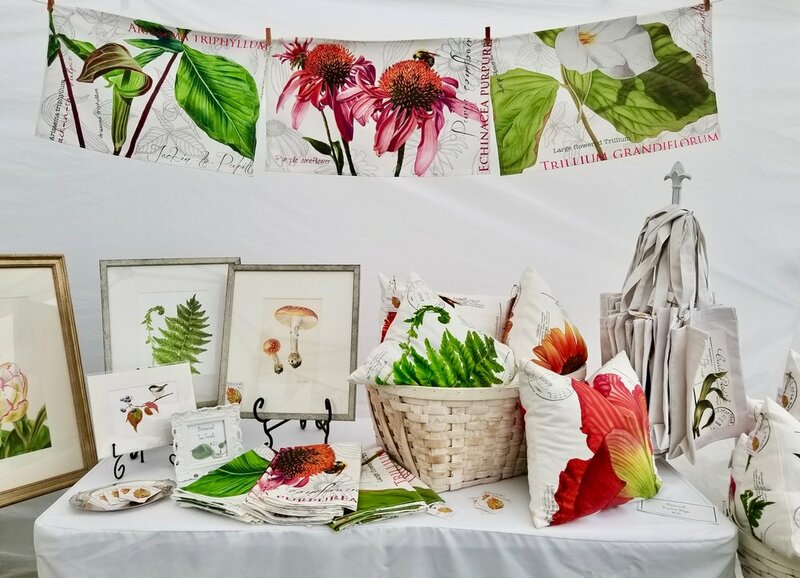 Lately though there seems to be a new interest in these sweet gatherings of vendors and shoppers, wandering through little white tents or tables, gathering hand made and homegrown goodness, maybe like people used to do before there were 'supermarkets'. Now you'll also find artist markets, makers markets, vintage markets, garden markets, etc. in the upcoming event promotions of things to do with your weekend...I LOVE IT! 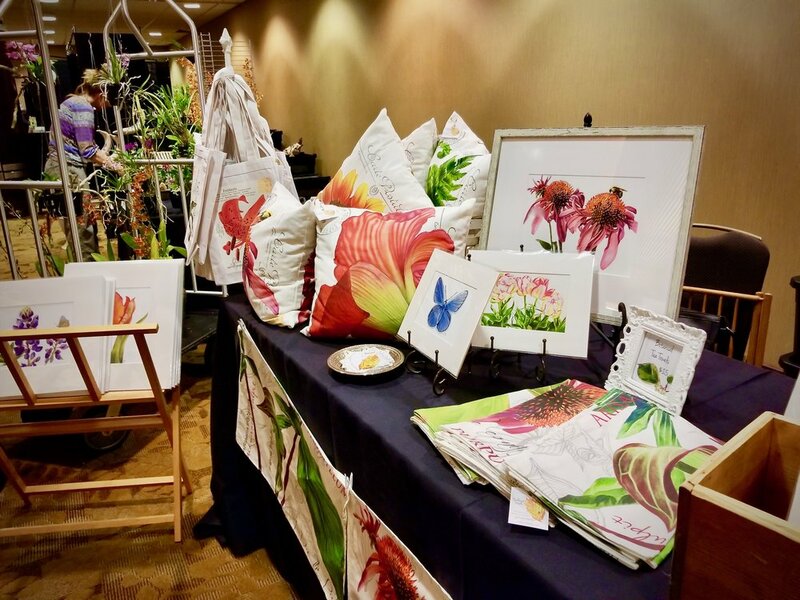 If I'm not vending or selling my wares at some sort of art/garden related marketplace, I'm probably attending one, because it's still fun to be on the other side of the table sometimes. And if I am vending at one, I so enjoy all of the people you meet and connections you make. The shoppers out enjoying their day, and the other vendors and artisans as passionate about their work as I am. They're always willing to share their stories on why they do what they do and how blessed we are to get to do what we love! So in addition to the 'advertising marketing' part of this awesome, crazy business adventure, there's also this 'to market we go' part. Yes, it's a lot of work to make it, take it, haul it all out there, pray for nice weather and nice crowds, and sell yourself shamelessly...but I still love it, from either side of the table. Sometimes you just have to get outside and breath the fresh air, take a walk in the woods, clear your head, ...especially after an extremely long winter like we've had this year. It's still too cold to plant my garden, but things are starting to green up a little and it's encouraging to see the first wildflowers popping up. Maybe take a sketchbook with you. No, everything doesn't have to be a masterpiece or even a finished work, or ready for a competition, or even for anybody to see but you. 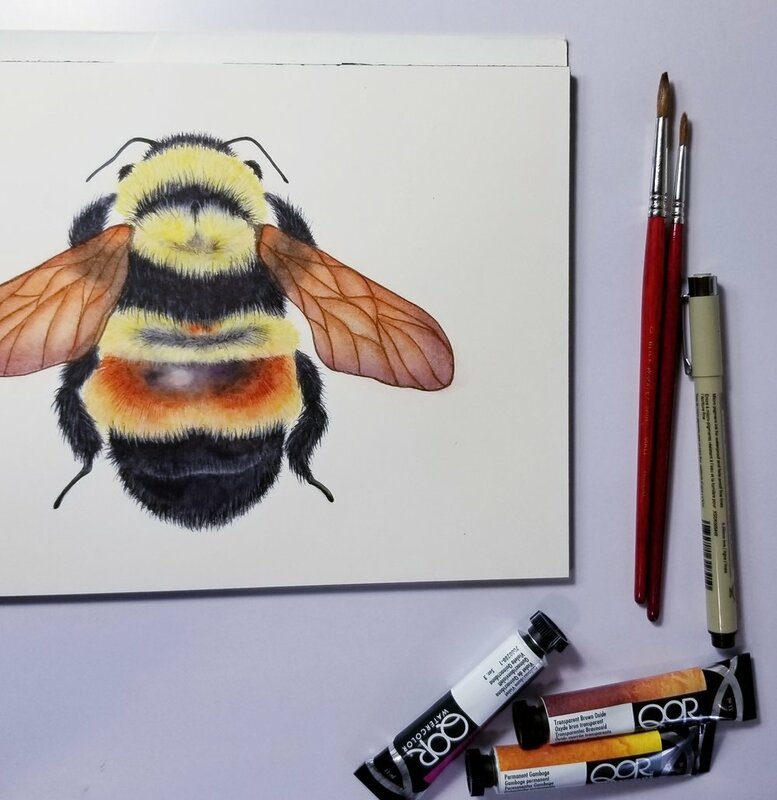 I meet so many people that say they can't draw, who told them that? Drawing is freeing, painting is calming, creating is good therapy, who couldn't use a little of those things? My sketchbooks very greatly between, simple watercolor landscapes, up close specimen details, value studies, random thoughts, doodles, scribbles. The point is to get out there...get quiet...listen...see...no I mean really see! Trust me, you'll be glad you did. Remember to bring something to draw on and a few little art supplies in your pack. If things won't sit still for you, you can always take a picture and finish it later, no worries!